I think these usually sell for around £99.99 with the chroma keys. I personally have one of these and it really hits the sweet spot between loud mechanical keys and silent membrane keys. Why does this have cold reviews, simply because razer? Well 99% of Razer products are genuinely crap, so probably. I read that Razer now use Kailh switches, not sure if that's the case with this one. Not that I have any problem with them because I bought one recently hotukdeals.com/dea…129 and I'm very happy with the Kailh Reds - so far, less noise and smoother to type with. I had a cheap Outemu Blue keyboard and the noise/stuttering keys drove me mad - and key smudging after a few months. I read that Razer now use Kailh switches, not sure if that's the case with …I read that Razer now use Kailh switches, not sure if that's the case with this one. 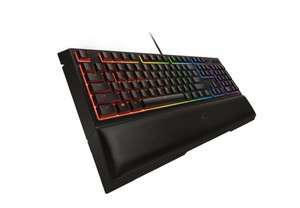 Not that I have any problem with them because I bought one recently https://www.hotukdeals.com/deals/qpad-mk-90-red-kailh-switches-rgb-mechanical-keyboard-amazon-warehouse-from-2895-price-after-20-deducted-at-checkout-2836129 and I'm very happy with the Kailh Reds - so far, less noise and smoother to type with. I had a cheap Outemu Blue keyboard and the noise/stuttering keys drove me mad - and key smudging after a few months.